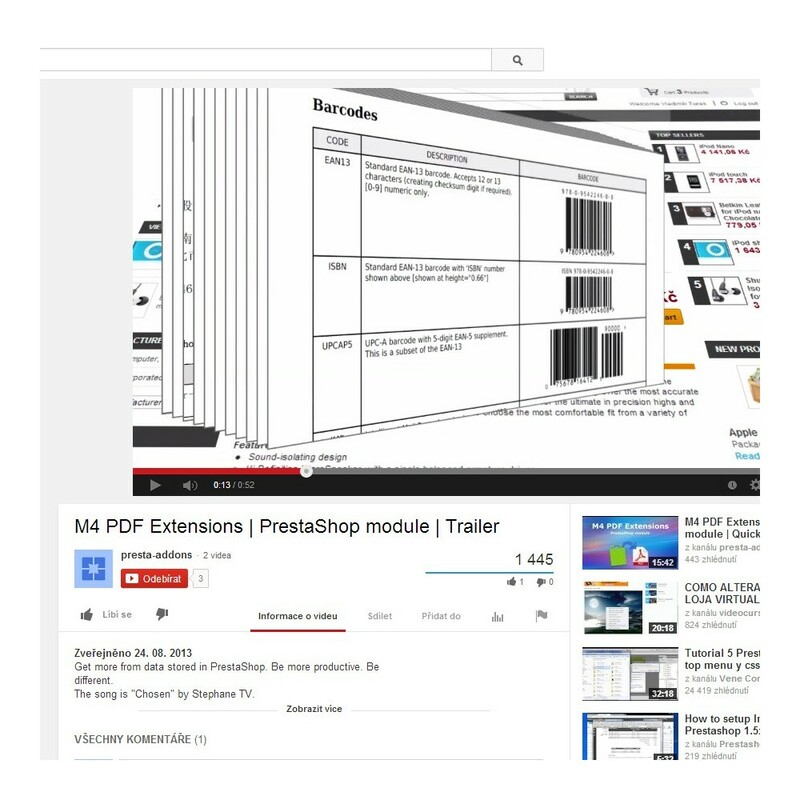 Work with PDF in PrestaShop on a higher level. Get more options for creating PDF documents in PrestaShop. 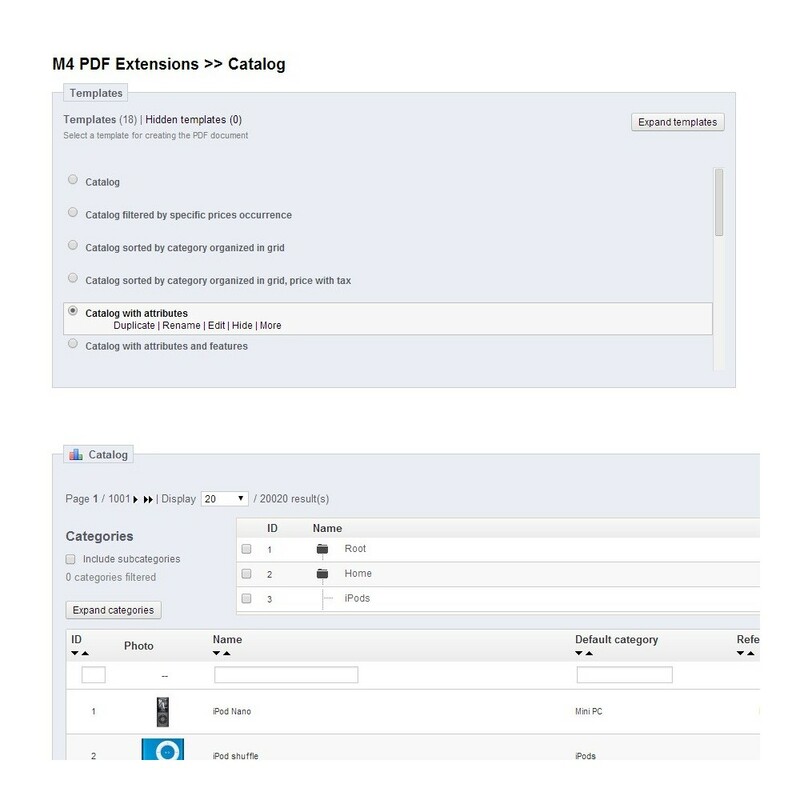 Using templates, you can create your own look for PDF invoices, mailing labels, product catalogs, price lists, and even more. Easily make minor template modifications. Completely redesign your templates in a fraction of the usual time. No need to search for the core PDF code improvements in forums and blogs, often available only for some versions of PrestaShop. Edit your own templates and save on professional design costs. Get new design options through the module, no need to learn PrestaShop code. Edit and create new templates even faster with the online editor. Improve a template and test it with real data in seconds. 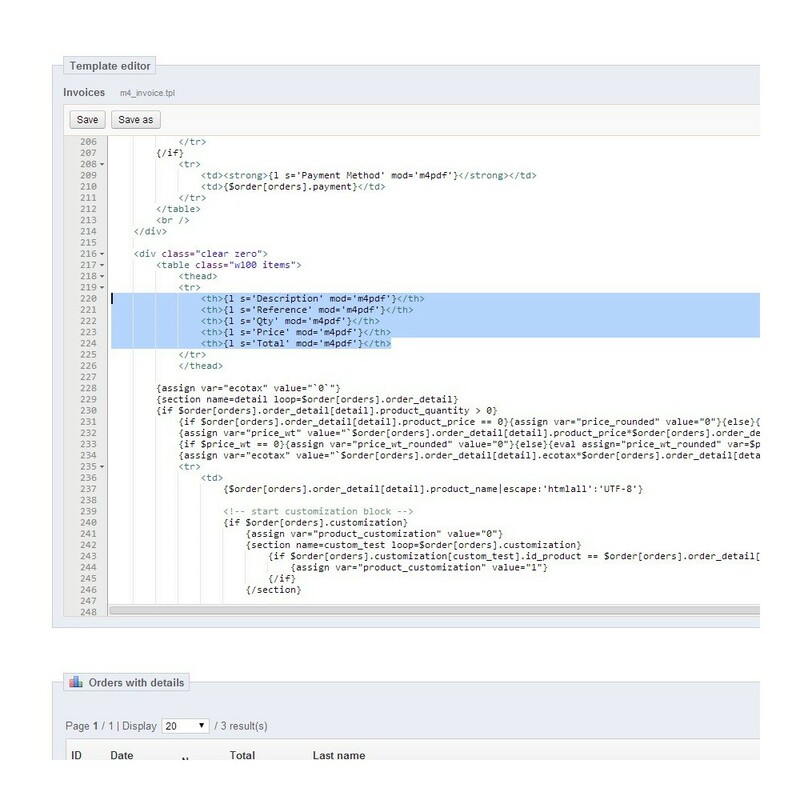 Get started with commented templates supplied with the module. Effortlessly create customized documents even with very different appearance. Built in debug template displays the available data for ease of use. Change the overall look of documents using CSS style. Editor supports syntax highlighting, automatic indenting, highlight matching, and parentheses. Use drag and drop or cut/copy, and paste - whichever you prefer. 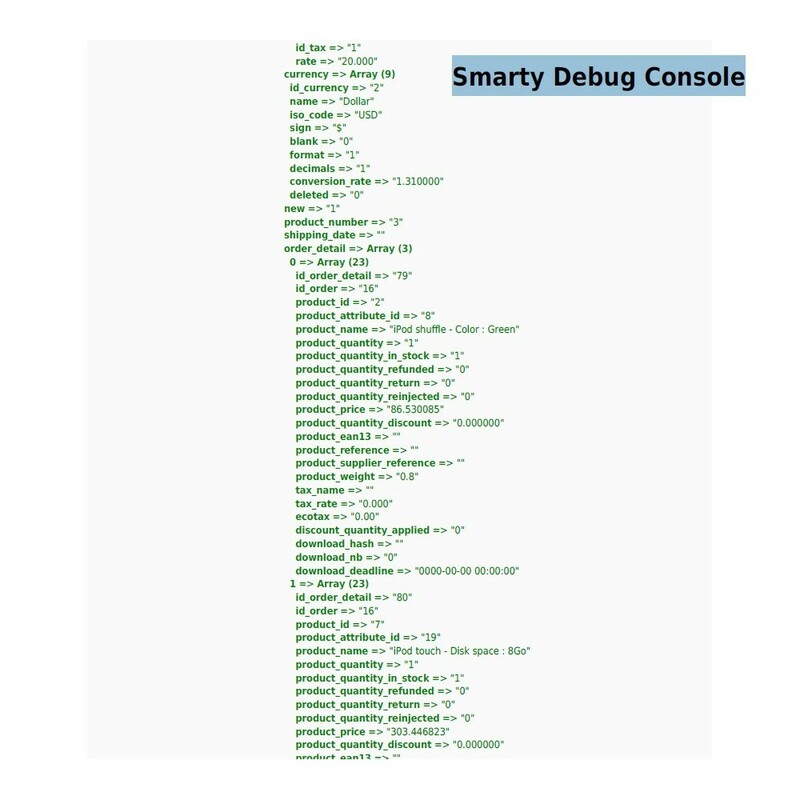 An HTML output option is available for debugging purposes. Ready to use sample templates. Options include invoice, delivery, and credit slip. Create product catalogs or catalog pages. 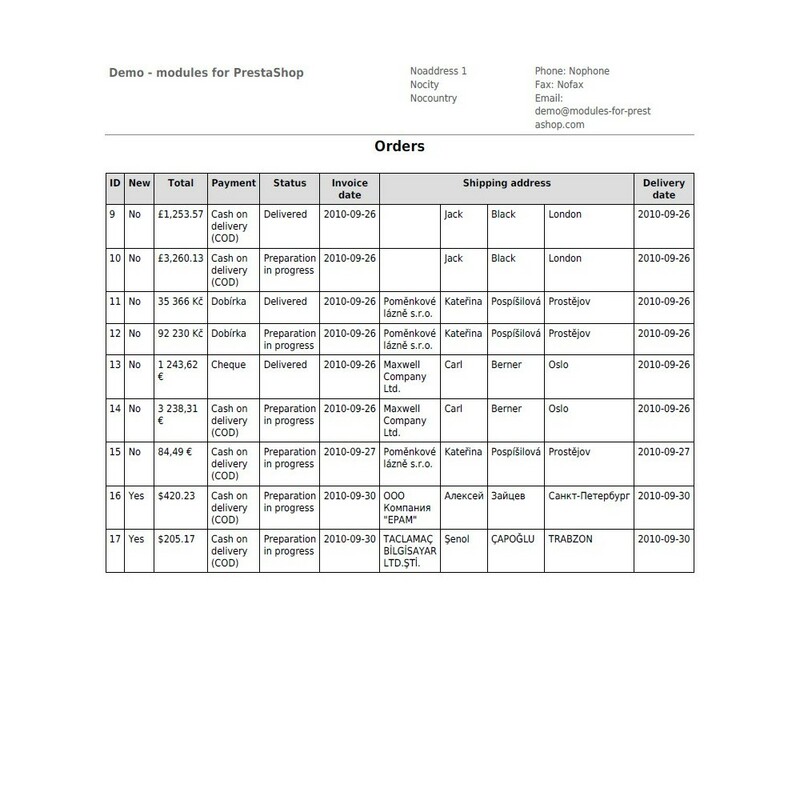 Create orders or customer lists. 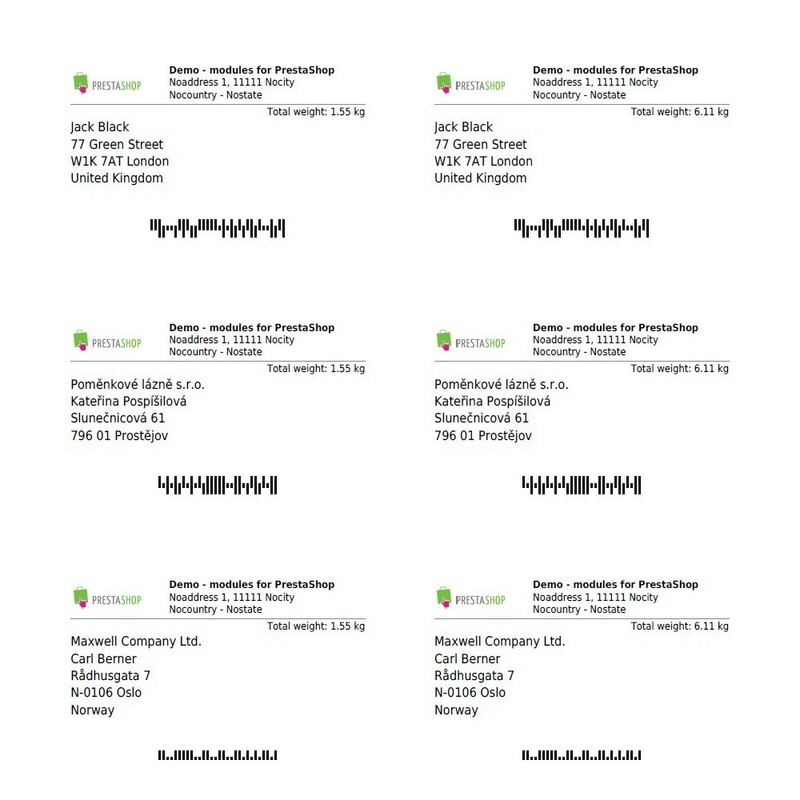 Print address labels or mailing labels with barcode. Create special PDFs like Membership cards. 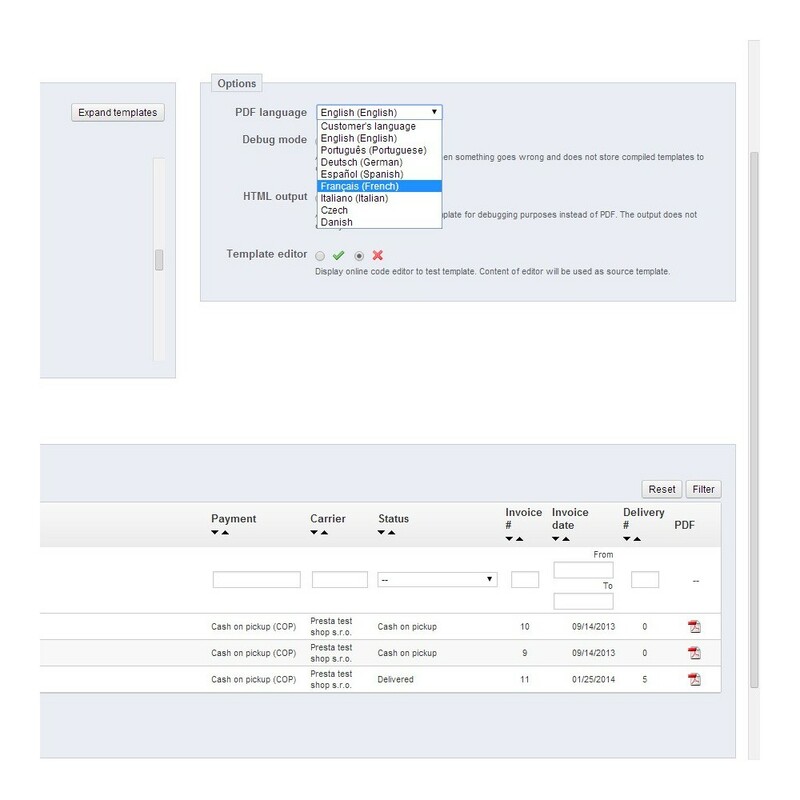 Use autofill for regular forms and preprinted boxes. Create an unlimited number of different outputs using templates. Use a different template for each purpose and/or see the same data in different ways. PDF documents for one record or for several selected records (pages or lists). Use your own images anywhere you want. 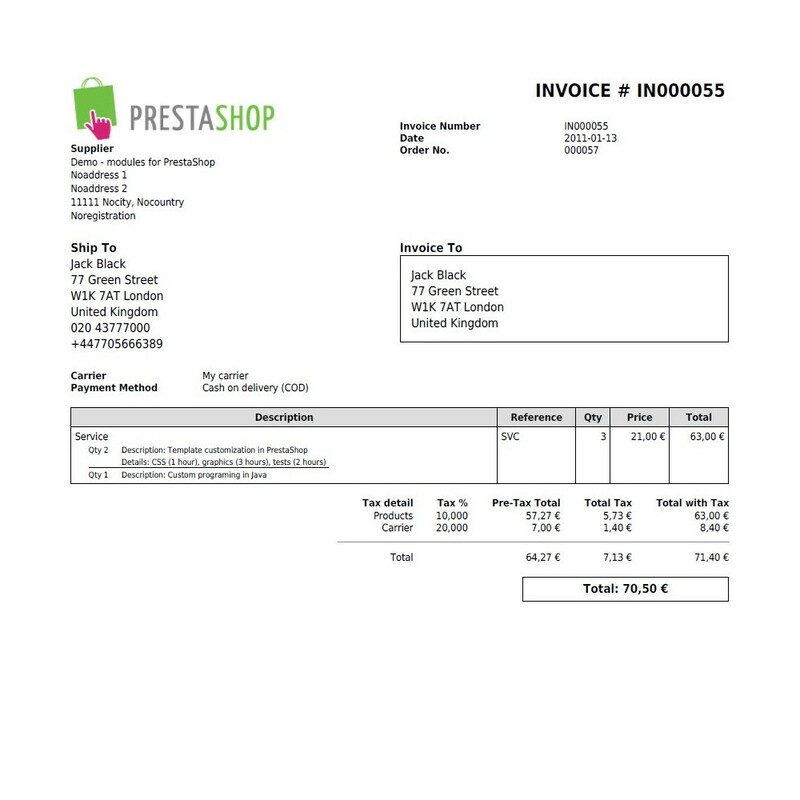 Use a watermark to create a special invoice or catalog look. Create a table of contents in a catalog or other larger collection of documents. Use headers and footers, repeating on all pages or only selected ones. Choose from EAN barcodes and 42 other codes, including QR code. Divide words and numbers by characters and fill in preprinted boxes. 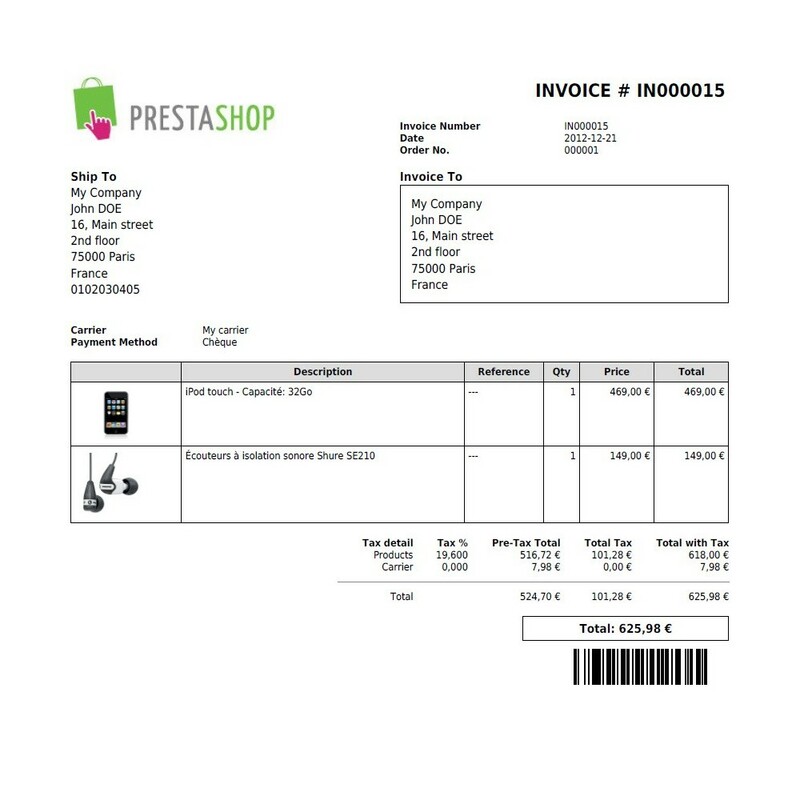 The original PDF invoice in PrestaShop is updated periodically. 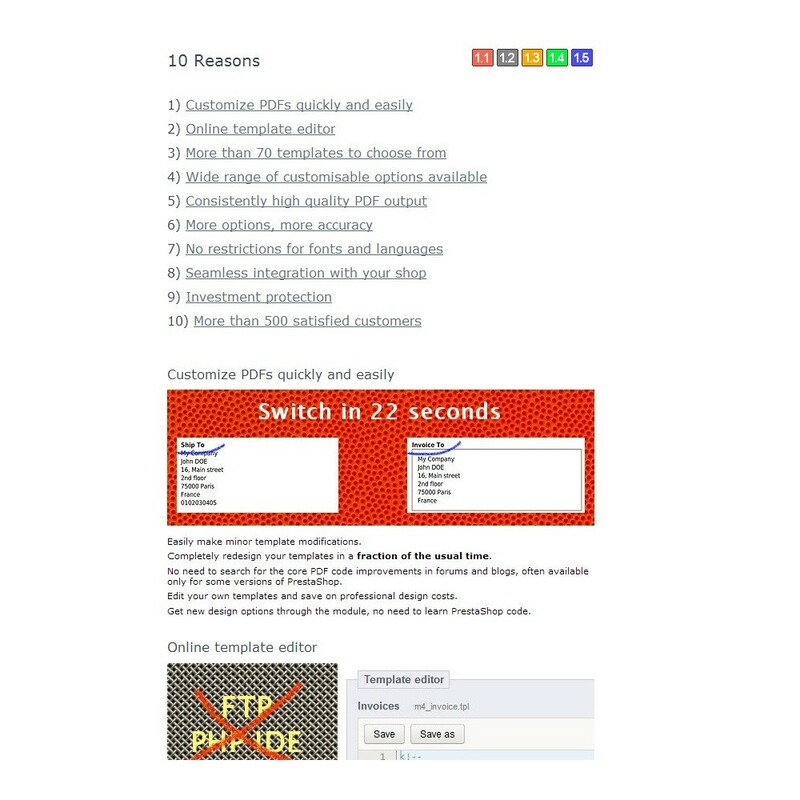 Consistent output regardless of PrestaShop version. Always have the most up-to-date version of PrestaShop . Easily customize the contents of invoices to comply with legal requirements of your country of residence. 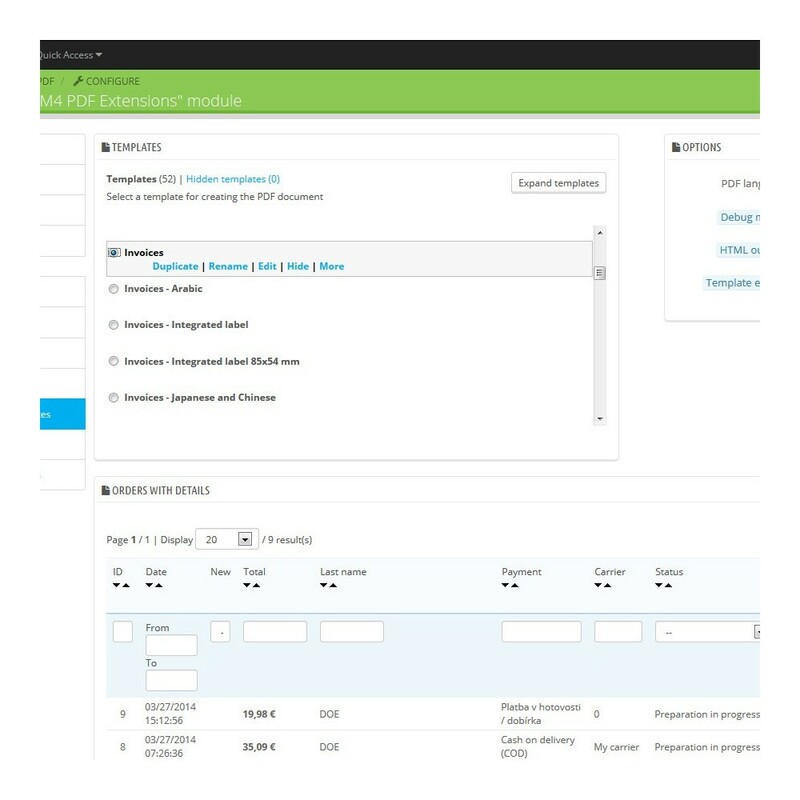 Produce different invoices for customers from different countries or using different languages. Get more from data stored in PrestaShop. 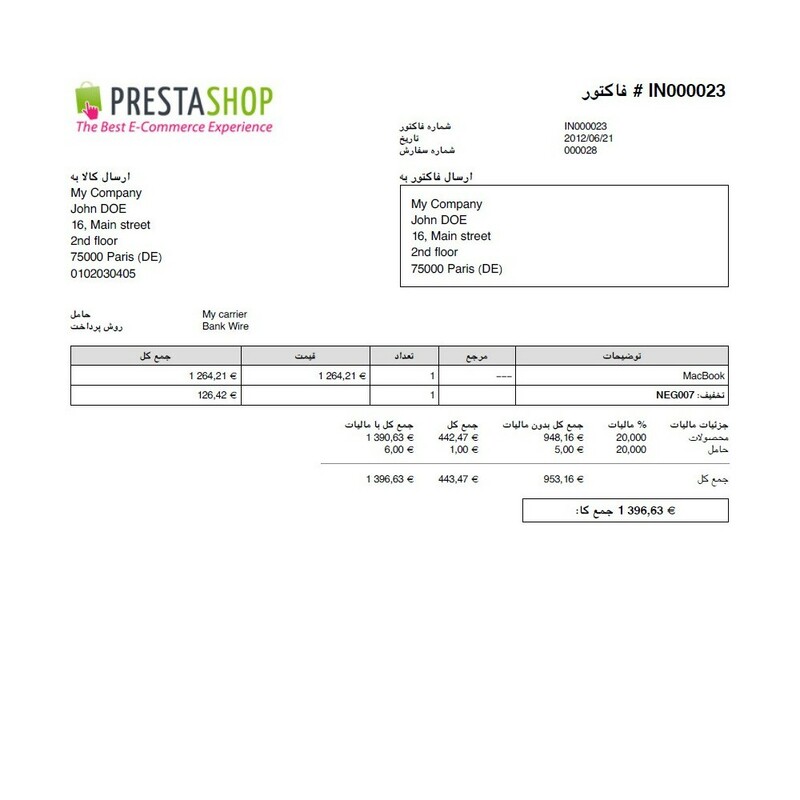 Customize the original invoice with your design. Support for additional user-defined fields in database. 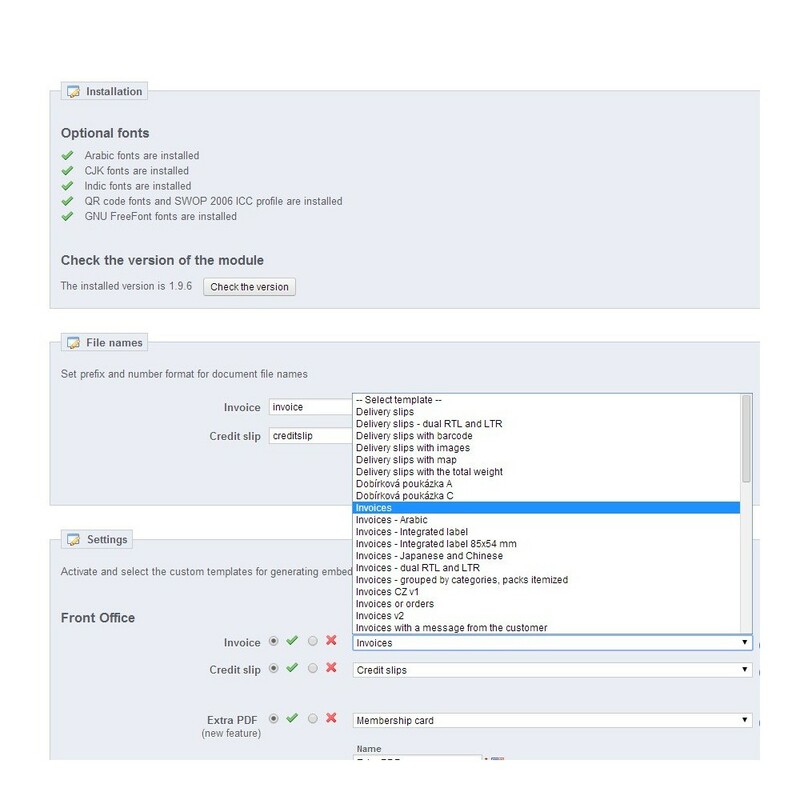 Change language in Back Office when printing invoices. Create a PDF in an inactive language. 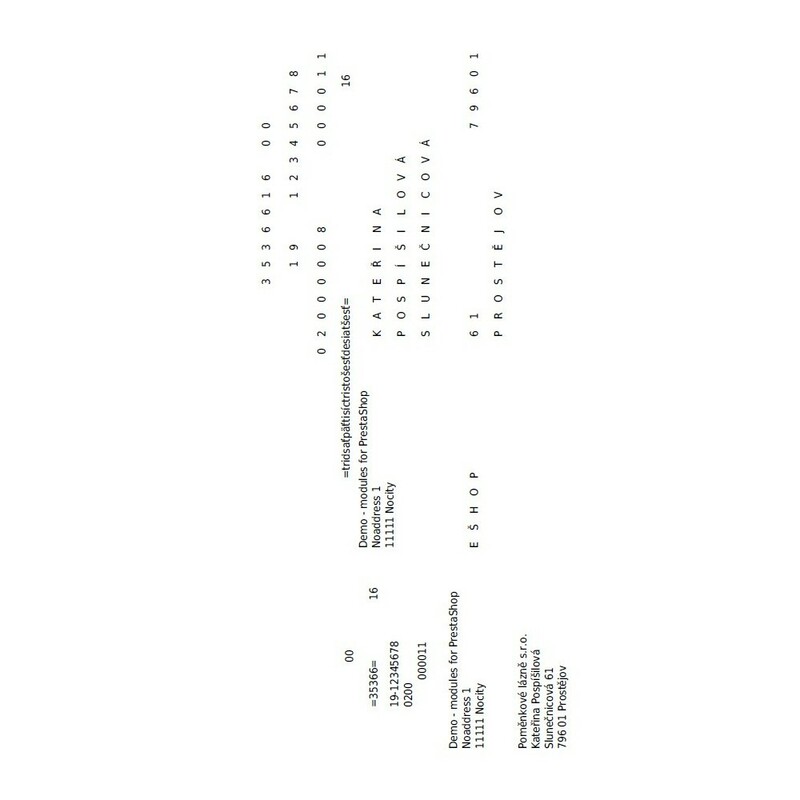 Templates support a degree of text memory making translation of new templates easier. Automatic correction of base and tax amounts in the tax breakdown in some versions of PrestaShop. 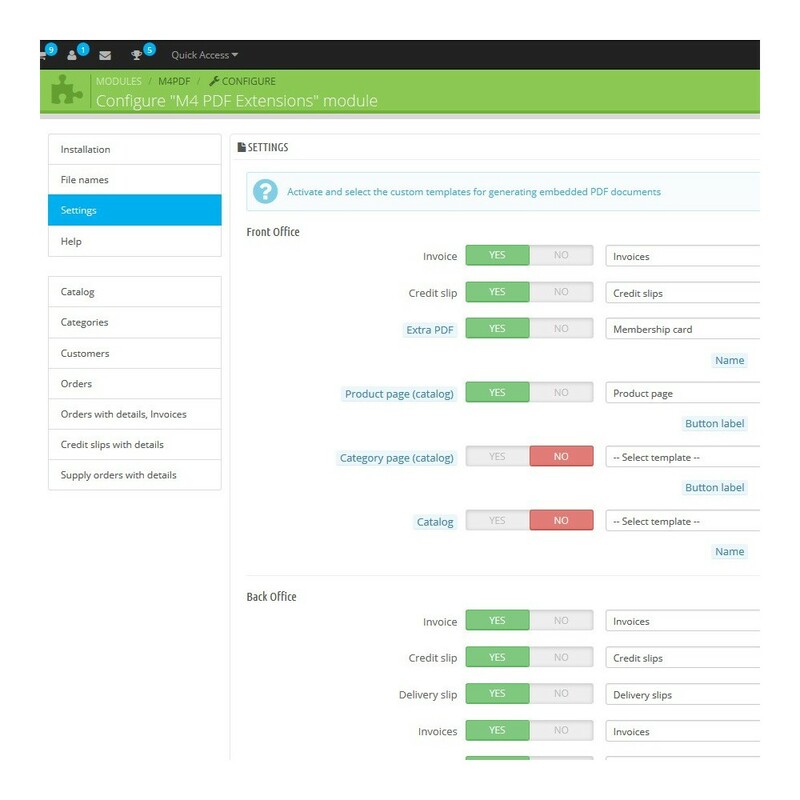 Intelligent calculation of order totals minimises issues with discount/VAT calculations in earlier versions. Additional data available for templates, including as packs, product details, and product images. Control invoice appearance - repeat headers on all pages, non-overlapping blocks etc. 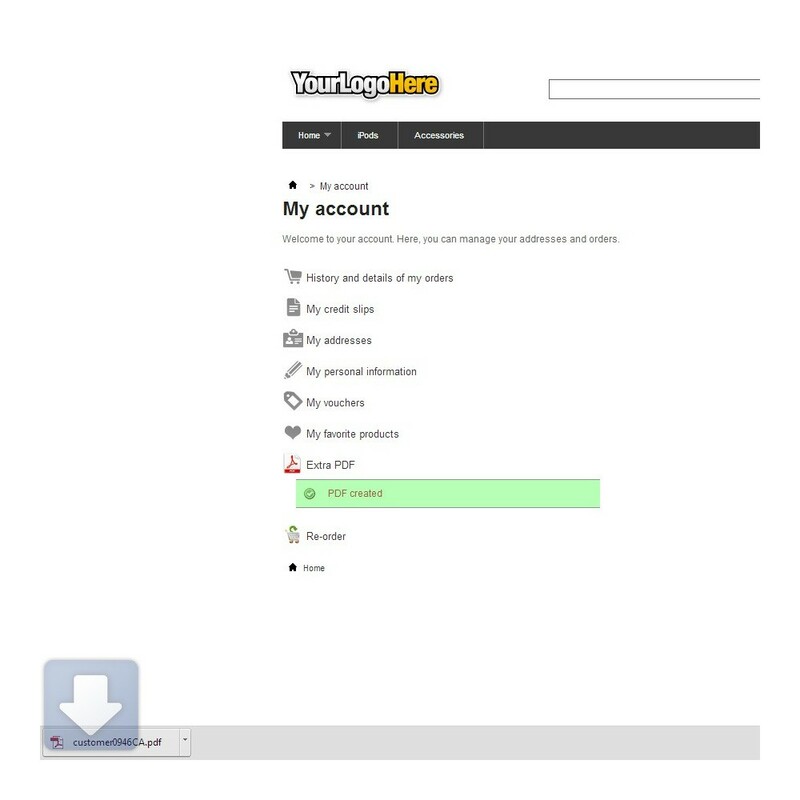 Create a special PDF in customer's account, for example a Membership card. 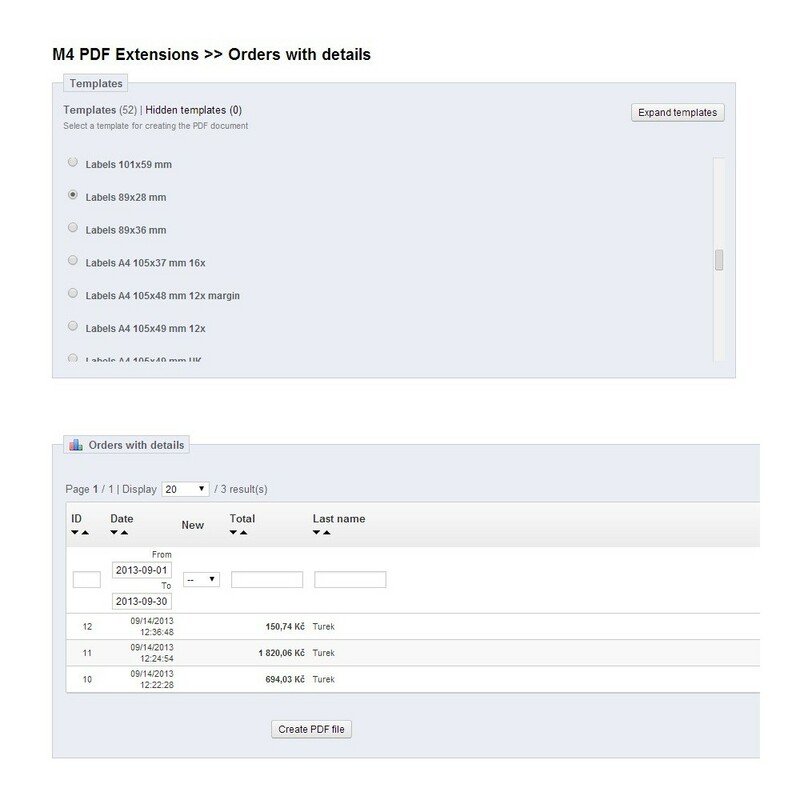 Let visitors create PDF Catalog page on the product details page. UTF-8 encoding fully supported in all versions of PrestaShop. Support for non-latin fonts - Arabic, Chinese, Cyrillic, Greek, Hebrew, Indic, Japanese, Korean, Thai, and more. Support for Right-to-Left (RTL) languages with automatic layout inverting and dual LTR and RTL templates. Multi-language support for user texts in templates. Ability to print localized amounts according to customer's country. Mix every font and language in one document. No PrestaShop code patching required. The module can be turned off without limitation of original functions. 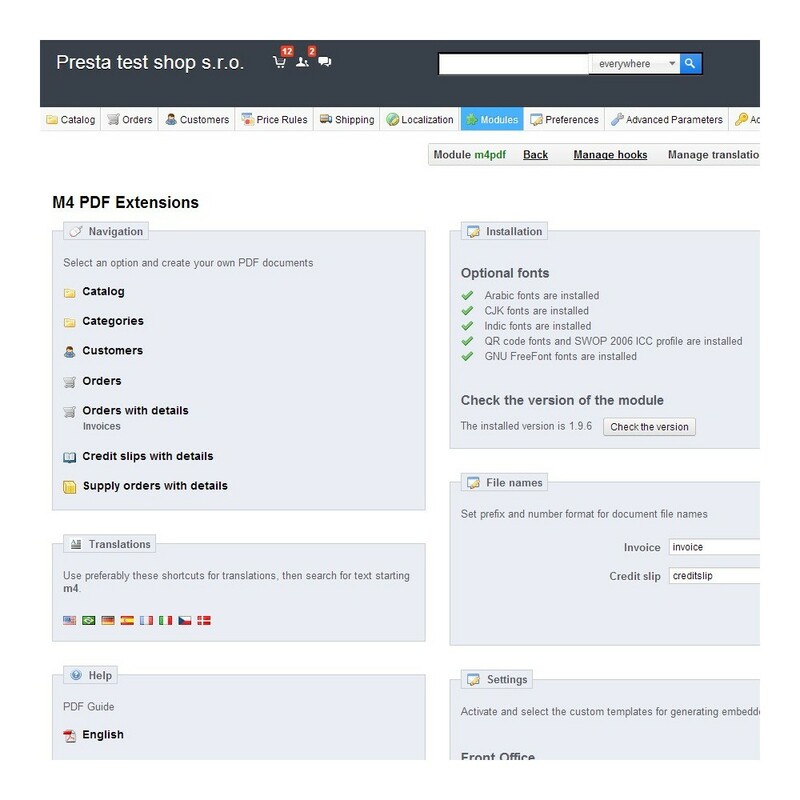 Finely adjustable replacement for built-in PrestaShop PDF documents. You can replace only part of them. 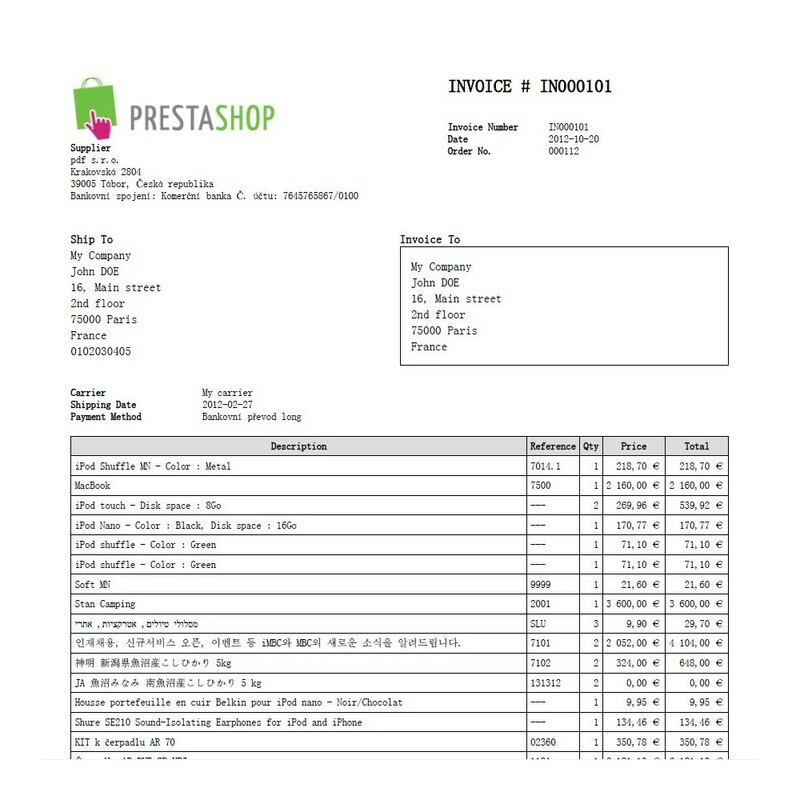 The same templates are used in all versions of PrestaShop. The module is compatible with PrestaShop v1.1 and all newer versions. 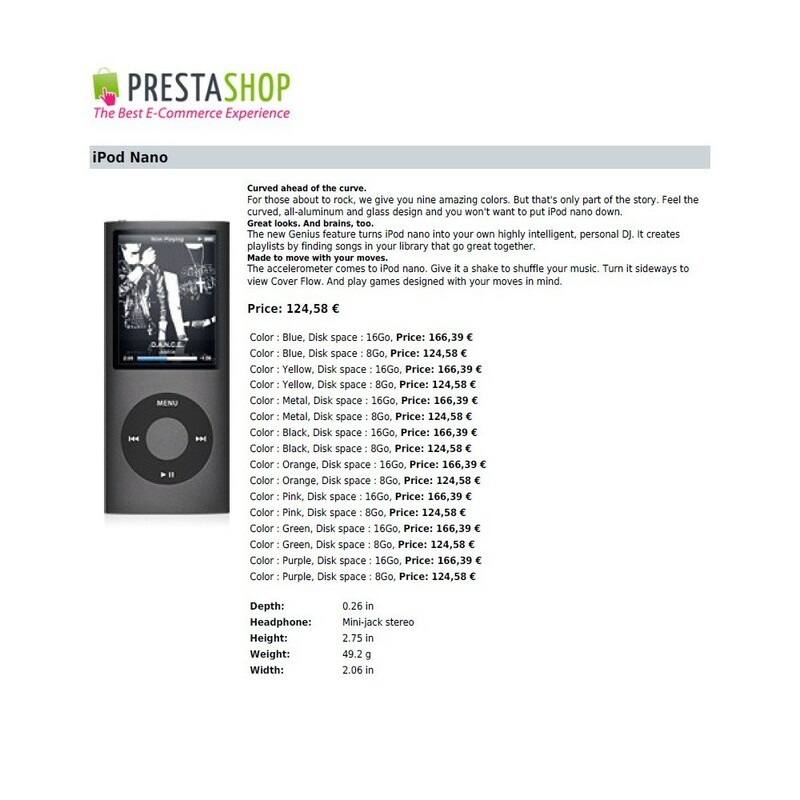 One version of the module for all versions of PrestaShop. This module is an investment in your business that will save you time and costs. The module is continually improved based on customer feedback. Your wishes and opinions are welcome. Custom design and customizing of templates also available. The module has been used by satisfied customers since 2010. Personaliza los modelos para la numeración de tus pedidos, facturas, albaranes y abonos, notas de crédito.Modifica el formato de la numeración de las facturas y los pedidos para facilitar la contabilidad de tu negocio. El módulo hace lo que dice que hace y si se necesita algo de soporte, son realmente eficiente y rápidos. The module does what it says it does and if you need some support , they are really efficient and fast.